Stewartby - Millbrook Leisure Rail Walk at Stewartby Walking RouteThere are many opportunities for enjoyable walks from stations on the Bedford to Bletchley rail line. The walks associated with this leaflet (there are four: Fenny Stratford Circular Walk, Stewartby to Millbrook walk via Stewartby Lake, Bow Brickhill Circular Walk, Ridgmont 'Clay Way' Circular Walk) are suggestions, suitable for most ages, but not advisable with pushchairs. The length of the walks is generally between 1 and 2 hours, depending on stops made at places of interest. These walks all begin and end at stations on the Marston Vale rail line. There are many opportunities for enjoyable walks from stations on the Bedford to Bletchley rail line. The walks associated with this leaflet (there are four: Fenny Stratford Circular Walk, Stewartby to Millbrook walk via Stewartby Lake, Bow Brickhill Circular Walk, Ridgmont 'Clay Way' Circular Walk) are suggestions, suitable for most ages, but not advisable with pushchairs. The length of the walks is generally between 1 and 2 hours, depending on stops made at places of interest. 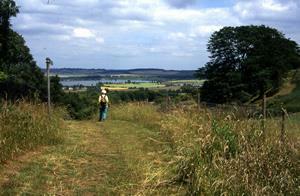 These walks all begin and end at stations on the Marston Vale rail line. How to get there by car/Parking: From Bedford take the A421 signposted for Junction 13 of the M1. Take the second exit to Stewartby. There isn't a designated car park for the station, the only option is on street parking in the village of Stewartby which is a short walk away.